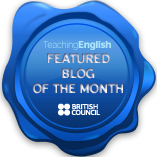 Another great mind-mapping fluency activity from Olya at ELT Stories. Just a short addition to the previous post in which I described how my B1-C1 students work on fluency by mining texts for related expressions, organizing them into mind maps and retelling the texts several times to different classmates. I use a very similar procedure with my group of pre-intermediate 7 graders to help them remember functional expressions used in social encounters (and generally in ‘Conversation Strategies’/’Everyday English’ sections of coursebooks). [analysis] The teacher helps them to analyze what kind of expressions are present in the dialogue and sketches a mind map on the board; the students copy the mind map and use the transcript to find expressions in the dialogue to add to the mind map.